To most baseball fans, Bus Campbell’s name is unknown. Born in 1921, he was a baseball lifer, starting by helping little leaguers in 1947 on the playgrounds near Denver. After working in construction, he went back to college, got his degree in physical education, and became a high school teacher and pitching coach in 1959. He spent most of his career in Littleton, Colorado, except for a short stint as a pitching coach at the University of Iowa. From Iowa he returned to the Denver area, where he remained a fixture on the playgrounds for decades, offering his wisdom to anyone who would listen. And Bus Campbell would not be the last great influence on Halladay. One of three children, and the only boy, Harry LeRoy Halladay III was born on May 14, 1977, in Denver. His parents, Roy and Linda, raised their family, which included Roy and his sisters Heather and Miranda, in Arvada, Colorado. The move to Arvada was predicated on finding a basement big enough to accommodate the 60-foot 6-inch distance from home plate to the mound, allowing young Roy, during the winter months, to throw balls against mattresses hung from the walls.3 Roy II was a commercial pilot and flying became a passion for the younger Halladay as well. Older sister Miranda blazed a sports path of her own, earning a basketball scholarship to Idaho State University. On the day he was drafted by the Blue Jays (the phone call came from his old mentor Campbell), Halladay said, “I’m just kind of speechless. They’ve been talking to me more than anybody else lately, and they said they would pick me if they got the chance. They’ve been calling all morning, getting Social Security number and things, so it sounded pretty positive.”8 With his father acting as his agent, Roy anticipated signing with the Blue Jays quickly. “I’d be very, very surprised — completely shocked — if I didn’t sign. Right now, my thinking is it would be awfully hard to pass up the Blue Jays. They’ve been a great organization, and they figure to be successful for a long time to come.”9 The Blue Jays had won back-to-back World Series in 1992 and 1993, but then hit a postseason dry spell that would extend until 2015. 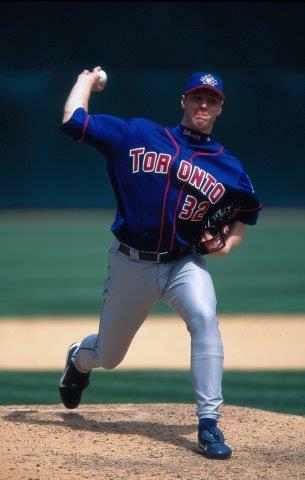 Halladay passed up a scholarship to the University of Arizona and signed with Toronto on June 30, 1995, for a bonus estimated at a club-record $895,000. Before signing, he hired an agent, Greg Landry, who would remain with him through his entire career. He made his professional debut in October with Toronto’s team in the Rookie Gulf Coast League, where he struck out 48 batters in 50⅓ innings. Though his won-lost record was only 3-5, he showed enough to be selected the fifth-best prospect in the league.10 In 1996 with Dunedin in the Class-A Florida State League, Halladay went 15-7, well above the norm on a team that went 67-70. It was a season when the 19-year-old Halladay, who had the most wins that season of any pitcher in the Toronto minor-league organization, matured into a team leader. In his first start, he opened eyes with a three-hit, eight-strikeout performance, but was not involved in the decision. “When I first came here, I didn’t know what to expect,” he said. “But I kept throwing a lot (in spring training) and doing well. The first time I started (in the team’s second game of the season), I think I was able to prove I belong here. That game was a big confidence-builder to me.”11 He also mastered the changeup in 1996. He was named his team’s most valuable player and was chosen for the league all-star team. In 1997 Halladay spent time in training with the Blue Jays and made his first spring appearance in a Toronto uniform on March 3, pitching two shutout innings, striking out four, against the Chicago White Sox. A week later, he was assigned to Knoxville of the Double-A Southern League, but before he departed for the minor-league camp, Blue Jays manager Cito Gaston gave his assessment of the 19-year-old: “He’s a kid who won’t be in the minors long. Whether it’s confidence or believing in himself, he has it all. He’s calm and cool out there.” In his final spring performance with Toronto, Halladay retired the last eight batters he faced.12 Halladay split 1997 between Knoxville and Triple-A Syracuse. In seven games in Knoxville he was 2-3 with a 5.40 ERA and 30 strikeouts in 36⅔ innings. His first appearance with Syracuse came on his 20th birthday (he was the youngest player in the league) and the opposition did not treat him well. He was tagged with the loss as Columbus defeated Syracuse, 5-3. He got off to a rocky start (0-5) with the SkyChiefs and wound up with a 7-10 record and a 4.58 ERA. Halladay returned to Syracuse in 1998 and went 9-5 with a 3.79 ERA, despite missing more than a month with a strained right shoulder. He was called up to Toronto at the end of the season. He made his major-league debut with a start at Tampa Bay on September 20. After five innings he left the game with a 5-3 lead, but the bullpen faltered, and he was denied his first win. In his second start, against Detroit a week later in Toronto, he carried a no-hitter and a 2-0 lead into the ninth inning. With two outs, Tigers pinch-hitter Bobby Higginson hit a home run that broke up the no-hitter and ended the shutout. After Higginson’s homer, Halladay got the final out for his first major-league win. “I took some things out of it,” he said. “I gained some confidence, so I think that it was a good thing that it happened. Depending on how I take that this year, that’ll show whether it was good or not.”13 It would take a while, but Halladay would have career moments that would put that brush with history in the rearview window, once and for all — it was definitely a good thing. Halladay made the Blue Jays roster in 1999. He split his time between the starting rotation and the bullpen, starting half his 36 games. He pitched 149 innings, going 8-7 with a 3.92 ERA. In his first appearance of the season, he appeared in relief on April 7, pitching three innings against the Twins to earn the only save of his career. He pitched his first career shutout against Detroit on May 20, winning 7-0. The following season was a disappointment. In his first eight appearances with the Blue Jays through May 15, Halladay was 2-4 with an 11.97 ERA. He spent the next month with Triple-A Syracuse, and returned to the Jays on June 24, going seven innings against the Boston Red Sox for the win. He was largely ineffective in his eight appearances after being recalled and at the end of July, sporting a 10.63 ERA, he was again sent to Syracuse. He was recalled again in September and finished the 2000 season with a 4-7 record and a 10.64 ERA. During the offseason, Roy, his wife, Brandy, and their infant son, Braden, relocated to Florida to escape the demands there were in Colorado because of Halladay’s celebrity status. During spring training in 2001, Halladay was “very distracted by the big picture. I’d be thinking about pitching seven innings and giving up three runs instead of about the pitch I was about to throw.”14 But two men — Harvey Dorfman and Mel Queen — entered his life, and his career was turned around. But as much as the still-young 230-pound right-hander needed help grasping the mental aspects of the game, his pitching fundamentals also needed work. His high-velocity fastball, delivered from an over-the-top motion, was coming in flat and was an easy target for batters, regardless of speed. Halladay worked his way back up through the minors to the majors in 2001. At Dunedin he was 0-1 in 13 games with a 3.97 ERA but did earn two saves. He made some steps forward at Dunedin, and his next step would bring greater rewards. That step took him to a Double-A ballpark in Kodak, Tennessee, near Knoxville, home of the Tennessee Smokies of the Southern League. Queen’s methods worked. In five games with Tennessee, Halladay had a 2-1 record and a 2.12 ERA. His next and final minor-league stop was at Syracuse, where he pitched in two games. He made it back to Toronto at the beginning of July and pitched in 17 games, going 5-3 with a 3.16 ERA. After showing sporadic signs of brilliance in prior seasons, Halladay emerged as a dominant pitcher in 2002. He went 19-7 with a 2.93 ERA in a league-leading 239⅓ innings. On June 7 at Toronto he had one of his best performances, yielding only two hits while shutting out the Rockies, 8-0, but the team was only 24-34 at the time, and only 20,032 saw his effort. No other Blue Jays pitcher had more than 10 wins and the team finished at 78-84, in third place in the AL East. Halladay was named to his first All-Star team, but was ineffective, yielding three runs in one inning, including a two-run homer by Barry Bonds. He completed only two games in 2002. That changed the next season. In 2004 Halladay had right-shoulder problems and made two trips to the disabled list. His season was first interrupted on May 28, after he defeated the Angels the night before. He felt soreness and was on the DL from May 28 through June 11. After returning he was largely ineffective and was back on the DL from July 17 through September 20 with shoulder fatigue. He returned for three late-season appearances and there was encouragement when on the last weekend of the season he held the New York Yankees to one run in eight innings to even his record at 8-8. For the season he pitched 133 innings and his ERA rose to 4.20. Halladay was back in form in 2005. Through July 3, he was 12-4 with five complete games and two shutouts. His ERA stood at 2.33 as he took the mound against the Texas Rangers on July 8. In the third inning disaster struck. Kevin Mench lined a ball off Halladay’s left shin. Roy fielded the ball and throw out Mench from a seated position. But he had to leave the game. X-rays revealed that he had suffered a nondisplaced fracture in his lower leg.22 His season was over. He was leading the American League in innings pitched and had been named to the All-Star team. Despite pitching in only 19 games, he led the league in complete games. Halladay came back in 2006 to go 16-5 with a 3.19 ERA and lead the league in won-loss percentage (.762). He was named to his fourth All-Star team and pitched two innings, allowing one run on a wild pitch. In his best performance of the season, on May 13 at Tampa Bay, he allowed only three hits as the Blue Jays won 8-1. However, the team again missed the playoffs, finishing second in the AL East with an 87-75 record. It was his first season since 2003 with more than 30 starts (32) and more than 200 innings pitched (220). Halladay’s success continued into 2007. He was 4-0 with a 2.28 ERA in April and didn’t slow down. Again he had a 16-win season, this time with seven losses and a 3.71 ERA. His best effort of the season was an 8-0, three-hit shutout of Seattle on July 22. He had a league-leading seven complete games, and it was the first of five consecutive seasons in which he led his league in complete games. He was not selected for the All-Star Game but finished in the Cy Young Award voting. Halladay’s ERA came down to 2.78 in 2008 and he was again a 20-game winner. He struck out a career-high 206 (a number he exceeded in each of the next four seasons). He returned to All-Star competition and pitched a scoreless fourth inning, retiring the three batters he faced. His record for the season was 20-11 and he led the league in complete games (9), shutouts (2), and innings pitched (246). In his best game of the season, he blanked the Yankees 5-0 on two hits on July 11. When the Cy Young ballots were tabulated, he finished second to Cleveland’s Cliff Lee. The 2009 season presented challenges that had little to do with Halladay’s pitching. Before the 2006 season he had signed a contract extension through 2010, and the Blue Jays were faced with a decision. They had not been to the postseason since their back-to-back championships in 1992-1993. Attendance was down and although Halladay was happy in Toronto, he would become a free agent after the 2010 season. Halladay, acknowledged by many as the best pitcher in baseball, had yet to show his mastery in postseason competition. When the Blue Jays were in fourth place as the season entered July, rumors started to surface that he was on the trading block. On July 6, with Halladay’s concurrence, general manager J.P. Ricciardi let it be known that he was seeking offers. As Doc had a no-trade clause in his contract, Ricciardi entered negotiations with contending teams authorized by Halladay.23 The Philadelphia Phillies were at the top of Halladay’s list. Roy and Brandy’s two sons, Braden and Ryan, were born while he was with the Blue Jays. Ryan was named for Doc’s childhood hero, Nolan Ryan. When he was 13, Halladay had purchased Nolan Ryan’s Pitcher’s Bible and followed Ryan’s conditioning protocol. Halladay was not traded in 2009, as general manager Ruben Amaro Jr. of the Phillies, was not willing to pay the asking price. Doc had taken a 10-2 record into July and during the trade talk had been named to his sixth All-Star team. He started the All-Star Game for the first time and allowed three runs (two earned) in two innings. For the season, he was 17-10, with an ERA of 2.79. In 239 innings, he struck out 208 batters. Again he led the league in complete games (9). His most impressive performance of the season came on September 4, a 6-0 shutout of the Yankees. Ramiro Pena’s double in the sixth inning was the Yankees’ only hit. The win was only the Blue Jays’ 60th against 74 losses. They finished in fourth place in the AL East, and on the final weekend of the season, Ricciardi was fired as general manager. Once again, Halladay watched the postseason on television. On the eve of the trading deadline when it looked as though he would be traded, Halladay had said, “I really feel like I’ve fulfilled a lot of obligations, and at some point, you have to be a little bit selfish on what you want (a postseason appearance). I’ve gotten to the point where I can make a decision on what’s best. It’s purely based on having a chance to win. I really do hope it’s here (Toronto). But I think for me, I hate to look back and regret that I had that three- or four-year window and I didn’t take the chance to give myself the best opportunity, and that’s really all I’m trying to do, whether it’s here or someplace else.”25 New GM Alex Anthopoulos, at the 2009 winter meetings, resumed discussions with Amaro of the Phillies and completed a deal that had Halladay move to Philadelphia in exchange for pitcher Kyle Drabek, outfielder Michael Taylor, and catcher Travis d’Arnaud. Doc left Toronto a fan favorite; as a token of his appreciation, he bought a full-page newspaper ad thanking the fans for their support, passion, and devotion since he first signed in 1995. The Phillies gave him a contract that extended through 2013 and his 2010 season would, by itself, justify the big investment. As the Phillies surged to an early league lead, Halladay was a major key to their success. On May 29 the Phillies led the NL East by 1½ games and Halladay sported a 6-3 record with four complete games and two shutouts. His ERA was 2.22 and he had struck out 59 batters in 77 innings. The Phillies were in Miami to play the Marlins at Sun Life Stadium, which was best suited for football. That night, before 25,086 spectators, he faced 27 batters and retired each one for a perfect game. He struck out a season-high 11 batters. In the All-Star Game, he pitched two-thirds of an inning, giving up two hits but getting a double-play ball and facing only three batters. During the second half of the season, the Phillies battled the Atlanta Braves and New York Mets for East Division supremacy. On July 21 they trailed the division-leading Braves by seven games. Then they caught fire. From July 22 through the end of the season, they were 49-19 and won the division by six games. Halladay during this stretch went 11-2, capping his 21-10 season with an 8-0 shutout at Washington on September 27 that clinched the division title for the Phillies. Doc finished the season with a 2.44 ERA. In winning his second career Cy Young Award (he was a unanimous selection), he led the league in complete games (9) and shutouts (4). His 7.30 ratio of strikeouts (219) to walks (30) was the league’s best. For the first time in his career, Halladay appeared in the postseason. On October 6, in the first game of the Division Series against Cincinnati, the Phillies’ ace, Roy Halladay, took the mound. At his home park, in front of 46,411 spectators and in view of a national television audience, Halladay pitched a gem. The Phillies jumped off to a 4-0 lead with three second-inning runs. And Doc did the rest. He retired the first 14 batters he saw, five by strikeout, before yielding a fifth-inning walk to Jay Bruce. Bruce was the only Reds baserunner. Halladay’s no-hitter, the second in postseason history, secured his place in baseball history. The Phillies swept the Reds in three games and faced the San Francisco Giants in the League Championship Series. 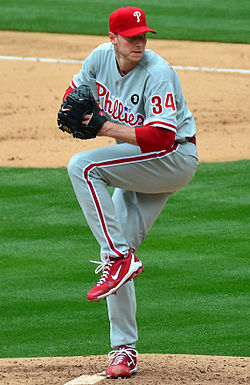 In the opener, Halladay was matched with the Giants’ Tim Lincecum. Roy extended his string of postseason hitless innings to 11⅓ before yielding a solo home run to Cody Ross in the third inning. The Phillies trailed 4-3 when Halladay was removed for a pinch-hitter in the bottom of the seventh inning and the Giants held on to take a 1-0 lead in the series. Through four games, the Giants had a 3-1 lead and Halladay and Lincecum dueled once again in Game Five. Halladay came out on top in the rematch to keep the Phillies alive. He was removed for a pinch-hitter after hurling six innings in Philadelphia’s 4-2 win. The Giants clinched the LCS in the next game. Halladay was back in dominating form for the Phillies in the following season, but it was time tinged with sadness as two of his mentors, Harvey Dorfman and Mel Queen, died within three months of each other in early 2011. Through June, Doc had a 10-3 record with a 2.40 ERA. On July 2 the Phillies visited Toronto and he was welcomed by 44,078 fans. He picked the occasion to hurl his sixth complete game of the season as the Phillies won 5-3 to extend their record to 53-31. Their first-place lead was four games. National League manager Bruce Bochy selected Halladay to start the All-Star Game on July 12, and Halladay turned in the best of his seven All-Star Game performances. In his two innings, he retired six consecutive batters as the National League won, 5-1. He continued to excel after the All-Star break and posted a 19-6 mark for the season. He led the National League with eight complete games and a 6.29 strikeout-to-walk ratio. His 2.35 ERA was his best since his abbreviated 1998 season and his 220 strikeouts were a career high. He finished second in the Cy Young Award balloting, the seventh time he had finished in the top five in the voting. The Phillies faced the St. Louis Cardinals in the Division Series and Halladay started Game One. He yielded three first-inning runs on a Lance Berkman three-run homer, but the Phillies came back with a vengeance, scoring 11 unanswered runs while Halladay was retiring the last 21 batters he faced. The bullpen yielded three ninth-inning runs, and Philadelphia won 11-6. In the decisive Game Five, Halladay faced longtime friend and former Blue Jays teammate Chris Carpenter in a duel that, after the first two batters, met all expectations. The two had been teammates in Toronto from 1997 through 2002. Those first two batters, Rafael Furcal and Skip Schumaker, of the Cardinals, tripled and doubled, and St. Louis had all the offense it would need. Carpenter shut down Philadelphia on three hits for the 1-0 win. Halladay came out for a pinch-hitter after hurling eight innings and allowing four hits after the first inning. The Phillies were eliminated three games to two, and Halladay had appeared in his last postseason game. Halladay turned 35 on the date of his team’s 36th game — May 14, 2012. He was 3-3 at the time, and uncharacteristically had yet to complete a game. He had soreness in his right shoulder and lasted only two innings in a start on May 27. Diagnosed with a strained right latissimus dorsi (a large muscle in the back), he was placed on the disabled list on May 29. The condition did not require surgery,26 and he returned to action on July 17. Over the balance of the season Halladay went 7-3 with an unsightly ERA of 4.93. The Phillies were unsuccessful in defending their division title, slipping to third place with an 81-81 record. Halladay’s 11-9 record brought him to within one win of 200 career victories. His 4.49 ERA for the season was his worst since his disastrous 2000 season. As 2013 dawned, there were question marks, and nobody realized that more than Halladay. “I think any player would honestly tell you, ‘You never know.’ Every year you come into spring training, and you come in hoping that you’re going to feel good and you’ll be able to pick up where you left off. But there’s no guarantees. I know that. And I’ve known that my whole career.”27 After faring poorly in his first two starts, failing to get past the fourth inning either time, Halladay took the mound in Miami. The Marlins were in their new ballpark, Marlins Park, and a Sunday-afternoon crowd of 21,412 was on hand. Halladay was his old self, allowing only one run on five hits, but his mates were able to get only one run in the first eight innings. In the ninth inning, Laynce Nix batted for Halladay and put the Phillies ahead 2-1 with a home run. Jonathan Papelbon came on to seal the deal, saving Halladay’s 200th win. Halladay followed that effort with an 8-2 win over the Cardinals five days later, but his season was one of frustration. After getting hammered by the Marlins on May 5, he complained of shoulder discomfort and had arthroscopic surgery shortly afterward to fix a bone spur, a frayed labrum, and a partially torn rotator cuff. He was out of action until August 25, when he returned and pitched six innings as the Phillies defeated the Arizona Diamondbacks, 9-5. By then it was clear that there would be no more seasons for Roy Halladay. He finished the 2013 season with a 4-5 record. In his final start, against the Marlins on September 23, he faced only three batters, walking two. He left the game with "arm fatigue." One of the runners scored and he absorbed the loss. His final season showed him with a 4-5 record and a 6.82 ERA. That arm fatigue came after 41,091 pitches at the major-league level. In a 16-season career, he was 203-105 with an ERA of 3.38. In an era when complete games were rare, he had 67, leading his league seven times. Of those complete games, 20 were shutouts. After the 2013 season, with his Philadelphia contract at an end, Halladay signed a one-day contract to go back to the Blue Jays and announced his retirement at a press conference. He was inducted into the Canadian Baseball Hall of Fame in 2017. Having displayed a work ethic second to none, a compassion for teammates and community that was the envy of his peers, and a pitching style and achievement reminiscent of a bygone era, Roy Halladay left the sport, and the sport was much the better having had him for 16 seasons. On November 7, 2017, Halladay took his ICON A5 Founders Edition amphibious plane up into the air near his Clearwater, Florida home. He crashed to his death in the Gulf of Mexico, 10 miles west of St. Petersburg. An autopsy showed that he may have been impaired at the time of the crash. According to the autopsy report released by the Pinellas-Pasco Medical Examiner’s Office, Halladay had high concentrations of morphine and amphetamines in his system. Present in his blood were also an antidepressant, the sleeping aid Ambien, and trace amounts of alcohol. On March 29, 2018, in Opening Day ceremonies, the Toronto Blue Jays retired his number 32. On January 22, 2019, it was announced that Halladay had been elected to the Hall of Fame as a member of the induction class of 2019. An earlier version of this biography was published in SABR's "No-Hitters" (2017), edited by Bill Nowlin. Schwarz, Alan. “Simply Unhittable,” New York Times, April 5, 2009: SP1. 1 Jack Etkin, “Bus-Man’s Holiday — Long Time Pitching Coach Never Stops Teaching Colorado’s Top Prospects,” Rocky Mountain News (Denver), June 1, 1997: 14C. 3 Jim Salisbury and Todd Zolecki, The Rotation: A Season with the Phillies and One of the Greatest Pitching Staffs Ever Assembled (Philadelphia: Running Press, 2012), 43. 4 Jeff Hamrick, “Arvada West’s Halladay Takes Turn in Spotlight,” Rocky Mountain News, March 16, 1995: 12B. 5 Neil H. Devlin, “Halladay: Ready, Willing, and Able,” Denver Post, March 21, 1995: B-10. 6 Norm Clarke, Rocky Mountain News, October 24, 1995: 2B. 7 Neil H. Devlin, Denver Post, June 18, 1995: B-10. 8 Devlin, “Blue Jays Declare Halladay Arvada West Pitcher is No. 1 in Toronto,” Denver Post, June 2, 1995: D-1. 9 Randy Holtz, “Toronto Gets Halladay with 17th Selection,” Rocky Mountain News, June 2, 1995: 9B. 10 Etkin and Tracy Ringolsby, Rocky Mountain News, October 9, 1995: 21B. 11 Bob Putnam, “Don’t Let Age Fool You, He’s a Vet,” St. Petersburg Times, July 28, 1996: 9C. 12 Anwar S. Richardson, Tampa Tribune, March 9, 1997. 13 Matt Michael, “High Standards: Near No-Hitter Puts Pressure on Roy Halladay,” Syracuse Herald-American, March 28, 1999. 14 Phil Sheridan, “Halladay Pays Homage to a Treasured Mentor,” Philadelphia Inquirer, March 2, 2001: D1, D3. 15 Etkin, “Toronto Blue Jays Roy Halladay 2003 Pitcher of the Year,” Baseball Digest, January 2004: 22. 16 Salisbury and Zolecki, 43. 17 Geoff Baker, “To Hell and Back: How Doc Halladay’s 95 Days of Purgatory Turned Him into a Dominant Pitcher,” Toronto Star, September 27, 2003. 19 Etkin, Baseball Digest, January 2004. 20 Jon Siegel, “Halladay Guns for Sweet 16 in Streak,” Washington Times, August 1, 2003. 22 Stephen Hawkins (Associated Press), “Halladay to Miss at Least a Month, All-Star Start,” July 9, 2005. 23 Tyler Kepner, “Toronto’s Towering Ace Lingers at the Exit: Suitors are Circling as the Blue Jays Ponder Trading Away Halladay,” New York Times, July 26, 2009: SP1. 24 Bob Elliott, “Little Man Has Doc’s Heart,” Toronto Sun, June 27, 2010. 26 Jayson Stark, “Roy Halladay Out 6-8 Weeks,” ESPN.com, May 29, 2012. 27 Stark, “A Defining Year Awaits Roy Halladay,” ESPN.com, February 13, 2013. 28 David Cooper, “Blue Jays: Toronto Will Always be ‘Home’ for the Halladays,” Toronto Star, December 11, 2013. 29 “Even in the Twilight of His career, the Phillies Roy Halladay Remains a Legend Among Peers,” Yahoo Sports, March 1, 2013. 30 “Experts: Roy Halladay likely Impaired at Time of Fatal Crash,” USA Today, January 20, 2018.